Douglas City Hall is located at 101 North Fourth Street, Douglas, WY 82633; phone: 307-358-3462. Photo: Morton Mansion, ca. 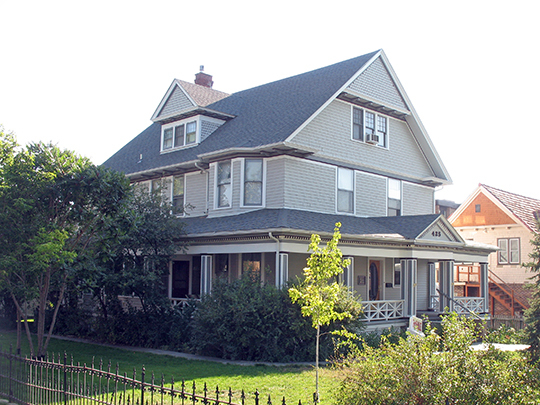 1903, 425 Center Street, Douglas, WY. Listed on the National Register of Historic Places in 1982. Photographed by user:Bill Coughlin (own work), 2012, [cc-by-3.0 (creativecommons.org/licenses/by/3.0)], via Wikimedia Commons, accessed May, 2014. Prior to the establishment of Douglas, Fort Fetterman near the mouth of La Prele Creek, was the only settlement in the area that was to become Converse County. The fort was established in 1867 to protect travelers on the Oregon and Bozeman trails and was abandoned in 1882. After its abandonment it was taken over by civilians and served as a supply center and entertainment focus for ranches in the area. Pioneering cattle ranches were being established by the late 1870's, but they often had to deal with marauding bands of Indians. The area became attractive to increasing settlement with the confinement to reservations of the Native American tribes who had formerly lived and hunted in the vicinity. A focus for settlement was the ongoing construction of the Fremont, Elkhorn, and Missouri railroad as it built westward from Nebraska. Settlers moved to the former location of the fort waiting for the announcement of the new terminus. This influx more than doubled the resident population. A twenty-four block townsite was laid out by the railroad and named in honor of renowned Illinois Senator Stephen A. Douglas, but they refused to allow anyone to build within the limits of the townsite until the tracks were completed to that point and the lots were auctioned. As a result, a temporary town grew up at the mouth of Antelope Creek one mile north of Douglas. By the time the first passenger train arrived on August 29, 1886 the temporary townsite had four streets lined with tents and shacks housing a population of at least 1600. For four days lots were auctioned and total sales amounted to $70,405 for 242 lots. The shacks and tents were immediately moved from the temporary town, set on lots, and permanent structures were completed as soon as possible. Within ninety days Douglas could boast of three newspapers, two banks, twelve general stores, twenty smaller stores, hotels, restaurants, lumber yards, drug and jewelry stores, two dance halls, and twenty-one saloons. Local hand pressed kiln-fired brick was made east of Douglas. By fall a school was organized for the local children. Unfortunately in October a typhoid epidemic hit the fledgling town, and one of the three people who died was the new schoolteacher. After such a boom town start, the disastrous winter of 1886-1887 hit Douglas hard. The destruction of a large percentage of the cattle on the range caused great hardship and even bankrupted some ranches. Douglas' existence as a supply point was severely jeopardized and this coupled with the onward extension of the railroad resulted in the population shrinking to less than 300 people. Those who were left carried on with the intention that Douglas would be their home. Several new buildings were constructed including a small brick school, two town wells were dug, and a volunteer fire department was established. Sandra Shelley, State Historic Preservation Office, Douglas City Hall, Converse County, Wyoming, nomination document, 1993, National Park Service, National Register of Historic Places, Washington, D.C.